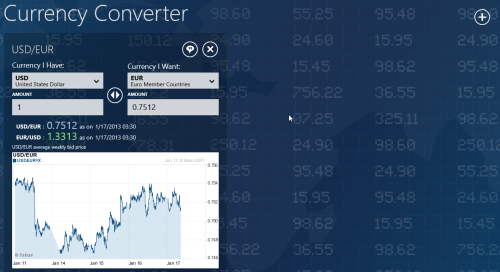 Currency Converter Windows 8 app is a simple app that lets you know the rate for currency exchange and to calculate the equivalent amounts in different currencies. This Windows 8 Currency Converter app can be easily located under Finance section of Windows Store. It is 100% free to use and supports all major currencies being used worldwide. This Currency Converter app for Windows 8 claims to provide accurate conversion rates that are fetched from Yahoo Finance on minute-to-minute basic. This is what makes Currency Converter Windows 8 app a perfect choice. On launching the app, you will be provided with following interface on the screen. You will be presented a form. You task will be select the two currencies. Use the dropdown in left for entering the currency to be converted and set other currency in adjacent dropdown. Below them are two text boxes. Your task will be to utilize the one in left for entering the amount. Soon after entering the amount the equivalent value will be calculated and show in the textbox to the right. In addition, it also provides you with graphical chart for showing the trends i.e. ups and downs in the comparative values of two currencies. On noticing, you will find a ‘+’ button at top-right corner which can be utilized for inserting new forms. This way you get the option for checking value of same/different currencies without having to close the window. If you click on the tiny call out button then the search-charm will be activated. You can then use the appropriate service for sharing. Also, check out our posts on Expense Tracker Apps, Barcode Generator Apps, and Unit Converter Apps. For Installing Currency Converter Windows 8 app you will have to open this link in Supported Browser such as Internet Explorer 10 or advance. Then click on ‘View in Windows Store’ Button followed by a click on ‘Install’. The size of application is only 2.86 KB and will not take much time to install. * The app requires permission to access your Internet connection. Currency Converter Windows 8 app is definitely a nice option to try. If you are not impressed by its performance then you can also check out featured post on Currency Converter Apps.